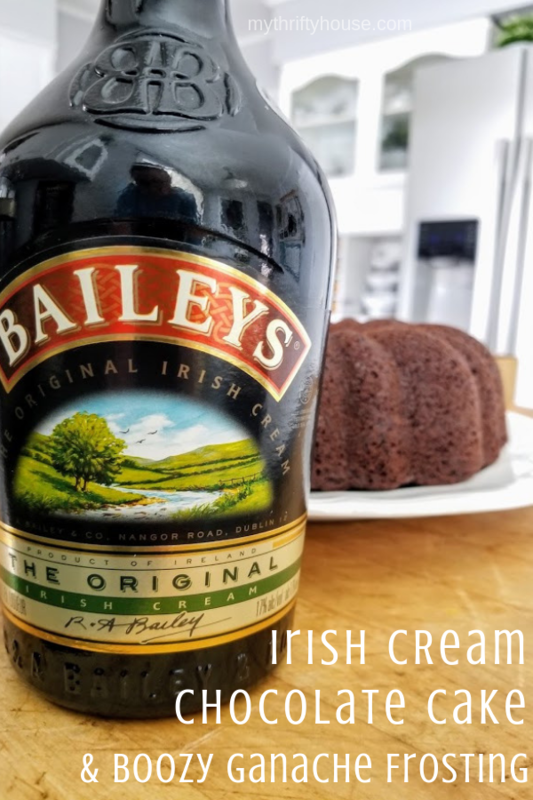 With St. Patrick’s Day right around the corner, I was looking for something simple, yummy and different to add to my menu. I certainly think Irish coffee chocolate cake with boozy ganache frosting has checked all three boxes on my list. SIMPLE. YUMMY. DIFFERENT. In my household, cake is usually saved for special occasions and comes from the store or bakery. No shame here. I recently found a cookbook, The Cake Mix Doctor, completely dedicated to doctoring up boxed cake mixes to taste like a cake made from scratch. I’m here to tell you, there’s nothing wrong with using some time saving techniques along with the tips and tricks shared by the Cake Doctor to get a delicious cake. 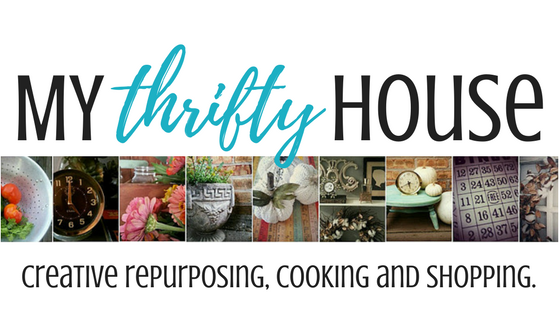 When you scroll through my dessert page you will see that I like quick and easy recipes. 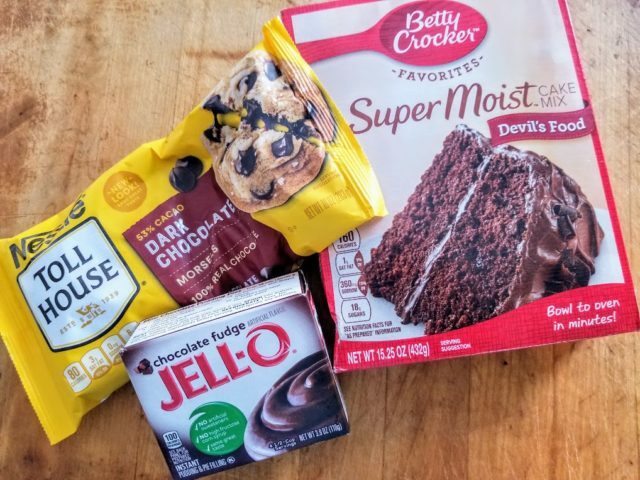 You can’t get much quicker or easier than a Chocolate Peanut Butter Cake made in the microwave in 12 minutes. Honest to goodness, amazing cake from a box and cooked in the microwave! 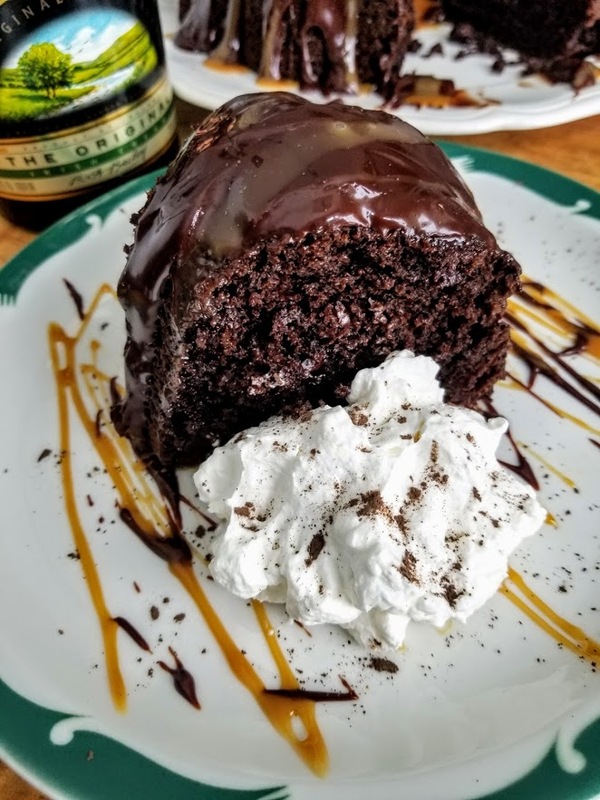 I tweaked several of the Cake Mix Doctor’s chocolate cake recipes and this is my spin on Irish Coffee Chocolate Cake with Boozy Ganache Frosting. 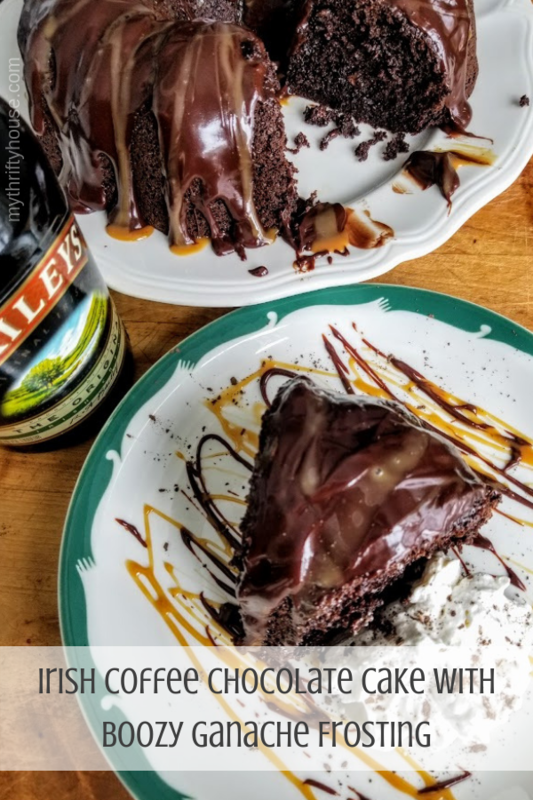 It has a dark, chocolate mocha flavor and the decadent ganache frosting gets it’s boozy flavor from Bailey’s Irish Cream. Pre-heat oven to 350 and grease a 12 cup bundt pan with vegetable shortening and dust with unsweetened cocoa. Add all ingredients, except the chocolate chips, into mixing bowl. Mix well until all ingredients are well combined. Batter will be a very thick consistency. Fold in the chocolate chips so that they are evenly distributed throughout the batter. Pour into bundt pan and bake for 45-50 minutes. Cake will slightly pull from side and spring back to the touch. Cool in pan on a wire rack for 10-15 minutes. Loosen edges with a knife, remove cake from pan and cool completely before frosting. I honestly never knew how beyond easy it was to make ganache until I made a salted caramel chocolate pie. What the heck was I worried about? Easy peasy and only 2 ingredients. In this case, there are 3 ingredients because I added some Bailey’s Irish Cream to the mix. 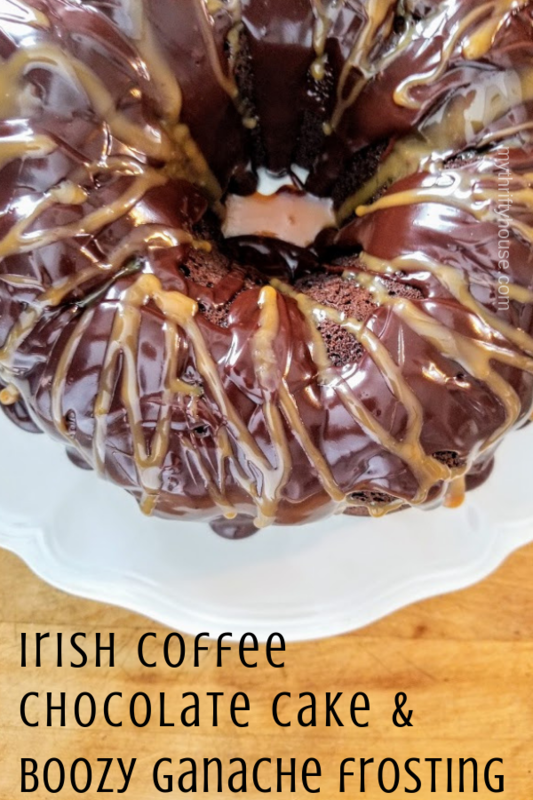 You could substitute other flavors of Irish Cream such as the Salted Caramel version. Place chocolate chips in a glass bowl. Bring 1 cup of heaving whipping cream and 2-3 tablespoons of Irish Cream to a simmer over low-medium heat. Do not boil. Pour over the chocolate chips and let sit for 3 minutes. Whisk the heavy whipping cream and melted chocolate chips until blended and creamy. It might briefly look like thin chocolate milk but keep slowly whisking and it will come together as a thick chocolate frosting. Slowly pour over the cake and let the ganache cool and set. 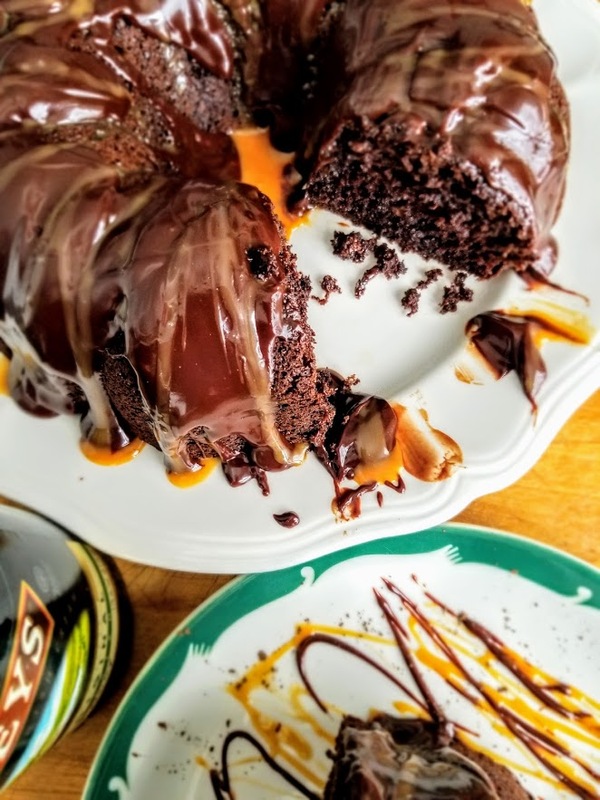 I drizzled some jar caramel sauce over the ganache and that’s totally optional. This part is totally optional but, most often Irish coffee is topped with whipped cream and there is nothing better than homemade whipped cream. 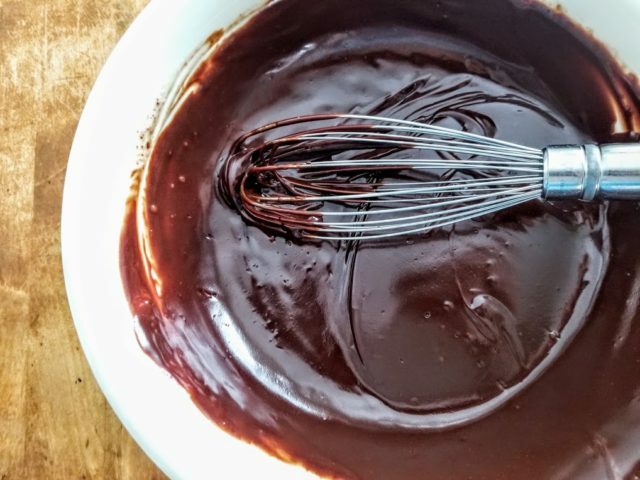 It sounds intimidating but like the ganache you will be pleasantly surprised how easy it is to make whip cream with just a few basic ingredients. Pro tip: Put your bowl and beaters in the freezer for 10 minutes prior to making the whipped cream. Add sugar, heavy whipping cream and Bailey’s Irish Cream to bowl. Beat/whisk on high until stiff peaks are formed. Now I get to wow my friends and family with a “doctored” up Irish coffee chocolate cake topped with boozy ganache Frosting and homemade whipping cream. Hopefully, they’ll think it came from the bakery. This entry was posted in Desserts & Breads.